This May be the Best School Supply Shopping Tip Ever! You are here: Home / Family Fun / This May Be the Best School Supply Shopping Tip EVER! I don’t know about you guys, but we are NOT ready for Back to School!! But, the back to school scramble may just be relieved a bit with this tip we discovered! Read on to hear about the BEST School Supply Shopping Tip Ever! Friends, August is here. And parents all across the country are getting ready to embark on that annual chore of back-to-school shopping. You know there’s about a thousand different things your kiddos need to be ready – from notebooks, pencils, outfits, lunch boxes, backpacks, shoes, and more, we have found the BEST Back to School Shopping Tip you will get this year! Do you hate school supply shopping?? With lists that are so specific sometimes you have to go to 4 different stores just to find the right stuff! Y’all this tip is LIFE-CHANGING when it comes to back-to-school shopping! Ok, so now you are saying that this tip is nothing new right?? How would you like to click on your child’s school list and fill your cart automatically? 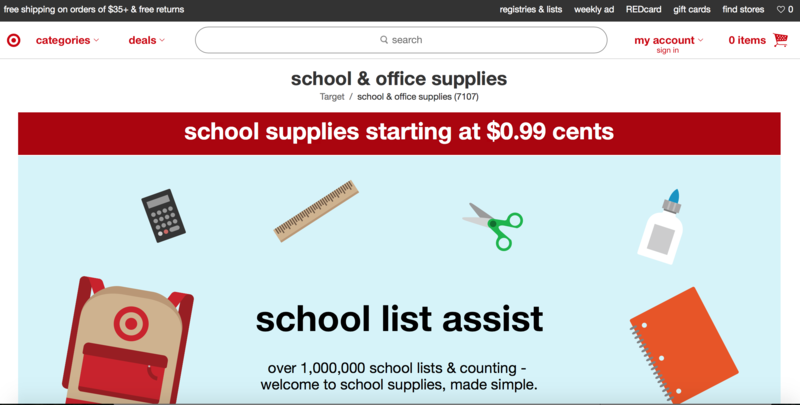 I just tried the Target.com School List Assist feature. In less than 1 minute, I was able to look up my child’s school and add their entire school supply list to my online cart. From there, you can make changes or add things if you need to. Then you can have YOUR WHOLE LIST delivered to your doorstep, or – get this – you can pick it up at a Target store near you and keep that tax money local. Even better, you can also do this for tax-free weekend if your state offers them. I just tried it over on Walmart.com and they had a similar system that was just as easy too. But surprisingly, Target’s prices were much better. So you could price match from the comfort of your home if you wanted to. Either way, I figured I just saved myself about 2 hours time shopping for the ONE kid who needs school supplies this year. Now to figure out how to get all their school clothes shopping done as easily!